As an economic system for a nation, socialism is a miserable failure. Especially real socialism (government ownership of the means of productions, government-dictated prices, etc). But that doesn’t stop some people from defending socialism. They claim the theory is noble since it is based on sharing and equality. And they even say that many things we like in society – such as the family, neighborhoods, community groups – are based on socialist principles. I think it would be more accurate to say those institutions are based on non-market principles rather than socialist principles, but that raises an interesting question. Would socialism be okay if it was voluntary? In a column for FEE, Tim Worstall explains that we shouldn’t object to socialism – so long as it isn’t coercive. …voluntary socialism does work sometimes, and it’s habitual now to mention Mondragon as an example of industrial companies that succeed as worker-owned organizations. But the two important words there are voluntary and sometimes. …worker ownership works better sometimes and that more capitalist organizational forms work better elsewhere. What we need is a method of sorting through what works best when—and that’s where the market comes in. …an interesting observation to make about that claimed superiority, of performance at least, of the socialist form. If it were truly more productive always and everywhere, then it would have taken over the economy already. In the real world, though, it’s hard to find examples of successful socialist entities. Consider what just happened to Panera Cares. If it was “a test of humanity,” then we failed. Interesting confession by Shaich. I wonder if we’ll ever see Bernie Sanders of Alexandria Ocasio-Cortez admit socialism doesn’t make sense. The Kibbutz in Israel were perhaps the most famous example of voluntary socialism. The late Gary Becker explained their collectivist structure. But this system has basically disappeared. By abolishing capitalistic organization, the founders expected members to live in contentment and harmony and to work for the common good. From what I was told and could observe during my brief visit, there was little harmony. Jealousy abounded, directed at those who were only a little better off… Kibbutzniks were also angry at slackers who appeared to be living off the labor of others. …the socialist zeal that propelled the kibbutz movement in its early days has now largely disappeared. …Many were forced into bankruptcy… Self-interest and family orientation are products not of capitalism but of a human nature developed under evolutionary pressure over eons. They will outlive any utopian experiment. …Utopian socialistic experiments like the kibbutz movement, and countries that tried to create large-scale efficient socialism, all failed for the same reasons. Indeed, not only have the Kibbutz faded away, but the entire nation of Israel has moved significantly in the direction of free markets. Some stories do have happy endings. I’ll close with this cartoon, which perfectly illustrates why socialism doesn’t work, regardless of the level of coercion. P.S. I can’t resist sharing an unrelated excerpt from Tim Worstall’s column. One of the primary objections to capitalism is the boilerplate insistence that in a capitalist system, the worker doesn’t gain the full value of her labor. This is exploitation, and something must be done about it. The argument has a major logical fault: It is a two-way street, for the capitalist doesn’t gain the full product of the use of their capital, either, meaning the capitalist is equally exploited. Labor and capital are complementary factors of production. Labor helps capital generate a return, and capital helps labor generate income. Which is why it is in the best interest of workers to get rid of capital gains taxes, lower the corporate tax rate, eliminate the death tax. The more investment we have, the more productivity goes up, and the more wages increase. Eh, I think 100% socialism like that is foolish, but a nonzero amount is probably good. There are times when a society has to let children and vulnerable people starve or not get medical care, but we aren’t there at the moment and it breeds a great deal of trouble and Ill will to act like we are. A somewhat modest UBI balanced with a carbon tax and raising interest rates would help a lot of people and possibly avert whatever is up with the climate. Couple that with some public option for minimalist health care and I think the economy would boom rather than suffer. I’m not even sure what 0% socialism would look like, no state cops or roads or schools? Cunosc situatia asta din Romania!Capitalism cu ajutor de la stat! I’m sure that AOC will be keeping that $10 million she recently got for her story. If she was a true socialist, she would give that money away, maybe to those “poor” illegal immigrants. However, as a posturing socialist, like Uncle Bernie, she will continue to spout socialist inanities, while living the life of not a capitalist, but life that a capitalist politician has come to expect. Even though money to politicians would be ill gotten gains, whereas selling your story to people dumber than you is legit. The ultimate capitalist scam. To my mind, the Panara experiment failed not because it was voluntary socialism but because it was involuntary capitalism. By removing the ability of the management to set prices based on costs, the Panara corporation created in actuality the straw man of evil capitalist exploitation that socialists are always claiming is the basis of poverty. Only they did it to themselves. Perhaps on a very small scale, collectivism can work. After all, we pool our work and efforts as a family. One could argue that for most of human existence, we lived in collectives known as tribes. There may be some problems with these analogies, but I prefer to think they highlight something that makes large-scale (nation-wide) socialism unworkable. In order to voluntarily share with others, we have to know them and care about them. Sure, we give to charities, or help others, but on a really large national organizational scale, this is unsustainable. Human being don’t seem to be designed/evolved to truly know or care about more than approximately 100 people. You can adjust that number, but it surely isn’t millions. from the first few times i saw bernie sanders in the news (just a few years ago) i knew that the man was the incarnation of evil. what amazes me is how all of the conservative think tanks, like FEE, talk about sanders as if bernie has good motives. his motives are on the same level as those of mao, hilter, lenin, stalin. the successful top socialists are all like this. evil. 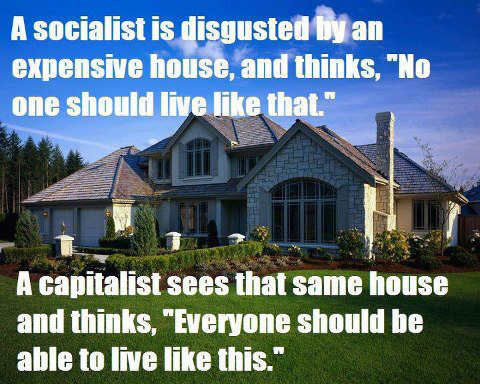 as usual, right on the mark… i would add though about the house pic ” a socialist is disgusted and thinks noone should live like that” … i disagree. i think what socialists, really successful ones like comrade sanders (he lives like that) and ortez, are truly thinking is “that house represents so much work and econominc activity, and that is opportunity… for socialist gov officials to get there grubby hands involved and force expensive bureaucratic procedures that allow to extract a lot of the wealth from that house”. thats what a true socialist is thinking… the problem is that in america its difficult for hard working honest peopl (like yourself) to be aware of the level of perversion of the socialist mind (my years in russia and china helped).